Knesset committee approves first reading of law to deduct terrorists' salaries from money transferred to Palestinian Authority. 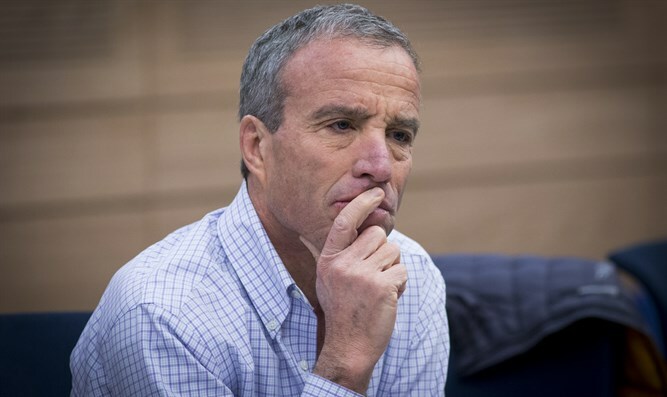 The Knesset's Foreign Affairs and Defense Committee on Wednesday unanimously approved a bill submitted by MK Elazar Stern (Yesh Atid) to deduct terrorists' salaries from the money Israel transfers to the Palestinian Authority (PA). For years, the PA has paid salaries to terrorists who carry out attacks on Jews. Pay is based on how many Jews were killed, whether the terrorist is married, whether he was arrested or spent time in jail, and other factors. In August 2017, PA Chairman Mahmoud Abbas promised, "I do not intend to cease paying salaries to the families of prisoners and martyrs, even if it means I lose my position. I will continue paying their salaries until my dying day." The law will deduct not only money which the PA pays directly to the terrorists, but money which any representative of the PA, including but not limited to the Palestine Liberation Organization, gives to terrorists. The definition of "terrorist" and "terror activity" will be broadened, and the Defense Minister will be free to choose the sources for his reports. The Committee also clarified that the deduction will be from the monies transferred to the PA in the year following the report. MK Avi Dichter (Likud), who serves as the Committee chairman and is one of the signatories of the bill, said "As long as the Palesitnian Authority is paying for terror, and as long as the money paid is transferred through us, we in the Knesset and the Foreign Affairs and Defense Committee cannot ignore it. We will not be a pipeline for transferring terror money."